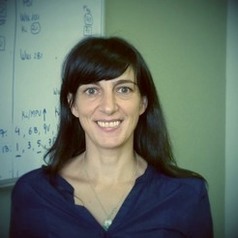 Dr Marta C Nunes is a senior scientist at the Meningeal Pathogens Research Unit (RMPRU) based at the Chris Hani Baragwanath Academic Hospital, Soweto, South Africa. Marta developed her PhD thesis work in Prof S Goldman's laboratory at the Department of Neurology & Neuroscience, Weill Medical College of Cornell University, New York, USA and obtained her PhD from the University of Lisbon, Medical College, Lisbon, Portugal in January 2004. During her PhD training she isolated and described a very unique multipotential neural progenitor cell population from the subcortical white matter of the adult human brain. These cells were known to give rise to oligodendrocytes, but Dr Nunes' work suggested that multiple fates can be elicited under defined culture conditions and after transplantation into animal models At the Pasteur Institute in Paris, France, during her EMBO and Human Frontiers post-doctoral fellowships Marta was involved in several projects dedicated to identify new malaria vaccine candidates for pregnancy malaria. Her main focus of research was the mechanisms of antigenic variation and switching of expression of variant surface molecules in Plasmodium Falciparum through which the malaria parasite is able to evade immune pressure and infect the placenta. Marta joined RMPRU in March 2009 and her research has been focused on reducing under-5 childhood morbidity and mortality from leading causes of death. This included evaluation of pneumococcal conjugate-vaccines in a setting with high HIV-burden, clinical and molecular epidemiology of respiratory viral associated-pneumonia and immunization of pregnant women. The work on pneumococcal disease included ecological studies on the impact of antiretroviral therapy on the burden of invasive pneumococcal disease in HIV-infected and HIV-uninfected adults and children. Furthermore, she studied the dynamics of pneumococcal transmission between young infants and their mothers and the impact of the vaccination schedule implemented in South Africa on pneumococcal carriage. A further focus of her research has been on the interaction of different putative pathogens on respiratory disease in children and the different manifestations in health and disease to these infections. This included the characterization of different respiratory viruses associated with hospitalizations in HIV-infected and HIV-uninfected children either in the presence or not of bacterial infections. Furthermore, in an ongoing prospective study she is investigating the relevance of Bordetella pertussis, Influenza and Respiratory Syncytial Virus infections in hospitalized young infants and the immune responses to these natural infections. To approach the problem of infant morbidity related to infections from a different angle she is exploring the potential of intervening through vaccination of pregnant women to protect the women and their babies against infections. This also includes the evaluation of the impact of preventing respiratory illnesses in pregnant women on reducing adverse birth outcomes such as premature birth, stillbirths and low-birth weight. Under her supervision RMPRU has conducted 2 large randomized-placebo-control trials of maternal influenza vaccination (2011-2012) and a third trial (2013) in HIV-infected women using different vaccination regimens.